Commercial A Frame Bike Racks are a popular choice. 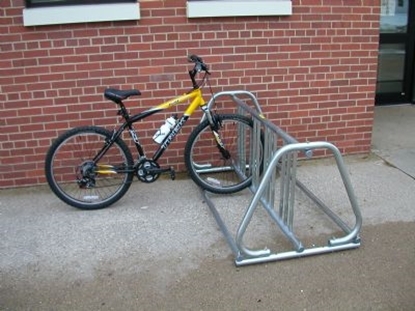 These efficient bike racks allow bicycles to be loaded on both sides for maximum use. Purchase multiple sizes based on your bicycle parking needs. Galvanized finish means commercial grade quality for public installations at schools, banks, retail centers where bike racks are required. These commercial A Frame bike racks will stand up to constant public exposure. Commercial bike racks provide secure bicycle parking for commercial areas such as public buildings, shopping centers, parks, and schools. Many children ride their bikes to schools and now you can get a powder coated bike rack to match your school colors.